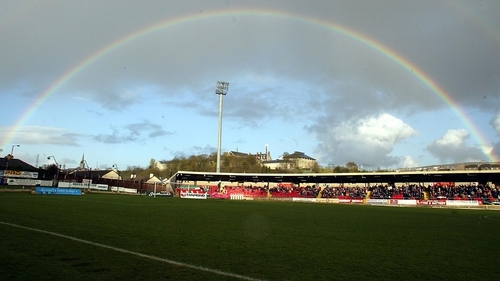 A Brexit rainbow for the Brandywell? "Customs union", "single market", "the backstop": most people will be familiar with these phrases as a result of the onslaught of Brexit commentary in recent times. Understandably, "League of Ireland football" is one area that has been less significant to both the United Kingdom and European Union's negotiating teams. But Derry City Football Club’s Brandywell stadium is located approximately three miles from what will become the only land border between the UK and EU. The current impasse between Westminster and Brussels presents potential logistical difficulties to their continued participation in the League of Ireland. The history of Derry City Football Club is unique, having won the senior league title of two separate Fédération Internationale de Football Association (FIFA) affiliated nations – Northern Ireland (1965) and the Republic of Ireland (1989). The outbreak of the Troubles in Northern Ireland between 1969 and 1972 also saw the end of Derry’s affiliation with the Irish League. Arguably, measures enacted by the then Irish League forced Derry out of club football in Northern Ireland. Derry’s "home" games versus Linfield were fixed at Windsor Park in Belfast from 1969 onwards. The club then lost its right to stage any of its home fixtures at the Brandywell in September 1971, following the burning of the visiting Ballymena United team coach by a local mob. From then, the club played all "home" games 30 miles away at the Coleraine Showgrounds. "There were six clubs against in Linfield, Glentoran, Distillery, Crusaders (all Belfast), Ards and Glenavon. We, of course, had our own vote, and Bangor, Cliftonville, Portadown and Ballymena United all stepped up to the plate. This only left Coleraine. How would our "friends" (having hosted all Derry’s "home" games for over a year) react? Cravenly, they abstained and we were out. It was the final betrayal." Derry City withdrew from the Irish League following that lost vote. "After 13 years of fruitless appeals to the Irish League for readmission", Mahon recalls, "four of us ex-Derry City players decided to have a tilt at going south although there was no precedent anywhere in the world". The defection of Derry City to the League of Ireland in 1985 was a seminal moment in the history of sport in Ireland. Unlike rugby, football in Ireland had been partitioned during 1921. The invisibility of that border in 1985 required the co-operation and approval of the Irish Football Association (IFA), Football Association of Ireland (FAI) and Union of European Football Association (UEFA) in facilitating Derry City’s defection. Between 2007 and 2012, a string of players who grew up in Derry or nearby embarked on similar defections. Despite in all cases having previously represented Northern Ireland at underage level, Darron Gibson, Shane Duffy, James McClean and Eunan O’Kane (from Feeny, approximately 15 miles from Derry) opted instead to represent the Republic of Ireland in senior international football. The eligibility dispute did not witness any of the previous cordial co-operation between the IFA and the FAI. FIFA and the Court of Arbitration for Sport (CAS), ruled conclusively in favour of the players' right to choose in 2010. There is little evidence that the FAI accepting "defectors" from the north, amounted to anything approaching a direct attempt to broaden its base or influence across the border into Northern Ireland. In contemporary political negotiations, some Conservative and DUP advocates of a hard-Brexit fear that any special arrangements for Northern Ireland within the UK’s withdrawal from the EU would align Northern Ireland closer to the Republic of Ireland, which they believe risks the union with Britain. Similarly, nationalist calls for a border poll on Irish unity have arisen from Brexit uncertainty. Brexit has arguably become a free-for-all for political causes and those holding economic interests in its outcome. Legitimate interests, such as those of Derry City requiring the continuance of their hard-won sporting alignment, have been relegated to the margins of the debate. The defection of both the club in 1985 and those who became leading international players for the Republic of Ireland was possible due to the arbitration of supra-national governing bodies. That freedom of movement may not be possible in future should the UK fail to agree an orderly withdrawal from its current supra-national political master. Mahon confidently predicted in August 2017 that "our present membership of the League of Ireland is undoubtedly permanent". Beyond the March 29th Brexit deadline, all Derry City fixtures in the League of Ireland require one team participating to cross the border. If no deal is reached between the EU and UK, physical border infrastructure could present travel difficulties for players and fans alike. READ: Is it time for Ireland to develop a national soccer museum? Nonetheless, Derry City Football Club and footballers from that city have perhaps reflected the dual-nationality principles of the Good Friday Agreement more than any other on the island of Ireland. Their cases are far too historically complex to be dismissed by any simplistic offering of the phrase that "sport and politics should not mix". The entanglement of hard-border politics with hopes for the continuance of soft-border football in Ireland is sure to be of concern to many at Derry City and other League of Ireland clubs in the coming weeks.